$590 for the season. $29.50 weekly rate. Full Plan share is intended for 2 adults and 2 children: A savings of $100 compared to the cost of two Half Plans. $320 for the season. $16.00 weekly rate. Half Plan share is intended for 1 - 2 people. $70 for the season. $3.50 weekly rate. Shitake mushroom Option can be added to either plan above. Thursday & Friday evenings, 4:30-6:00 pm. 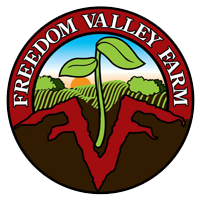 Freedom Valley Farm barn.